Must have been so exciting and actually a bit scary to watch re the Zebra re the lions. Fantastic capture ! Wow, congrats on being featured for Feb. 2019 for this amazing shot Pamela ! 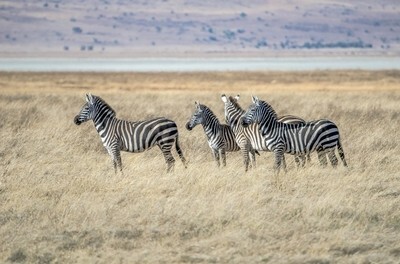 A group of Zebra in the Ngorongoro Crater watching a pair of hunting female Lions stalk a Warthog. The hunt was unsuccessful...and the Zebras immediately ran!